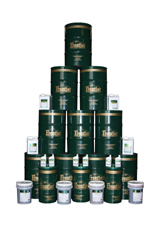 Frontier manufactures gear lubricants to cover a wide variety of applications. reduce wear and protect gear surfaces. ALLSYN PG Series synthetic lubricants are polyglycol-based products for use in enclosed gear, bearings, and compressors where conditions demand the unique properties of these fluids. Better wear protection, thermal and oxidation stability, and reduced sludge and deposit formation insure enhanced performance when compared to petroleum-based lubricants.